I’m too fickle to cook very far ahead – I mean, I can eat most things for two days max, then I have to move on. Not to mention many dishes taste pretty tired the next day (pastas, pizzas, lettuce salads, fish). But beef works, and is often improved with a day or two of rest. Particularly the braising cuts, like the three pounds of boneless beef short ribs I slow-simmered over the weekend. 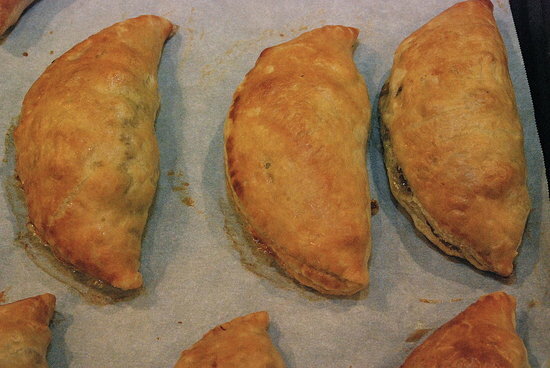 Last night they saw their third iteration (first two below) as meat pies, and oh boy were they good. This was leftover cookery at its most fun – a bit of this, a little of that. Puff pastry sheets from the freezer. One russet potato and one yellow onion from the pantry. A green pepper from the cooler. And a generous sprinkle of curry powder for some interest. 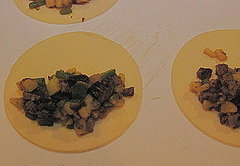 I diced everything quite small, sauteed the potato, onion, and green pepper together with the curry powder until tender. Stirred in the diced beef, seasoned with salt and pepper, let it all cool a bit. Then I rolled out the pastry, cut it into generous circles with a cereal bowl, filled and folded the pastry over, and sealed it up with an egg wash. I finished with an allover brush of the egg wash (or an allover wash of the egg? 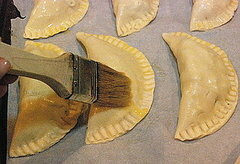 ), then baked the fat little crescents until crispy and golden brown, about 30 minutes at 350 degrees. Result? Rich, savory deliciousness, especially with braised kale alongside. The lesson here is that pretty much anything, diced and sauteed into a savory hash, would taste fantastic inside puff pastry. 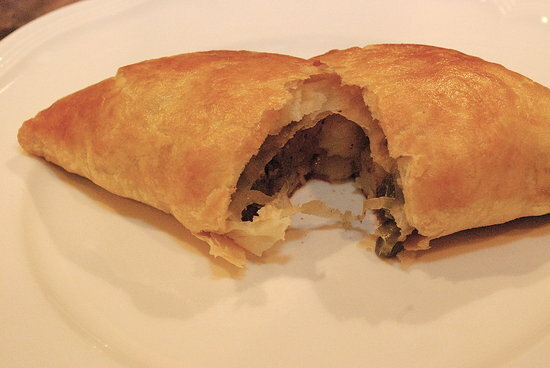 Doesn’t everything taste fantastic inside puff pastry? Next time you have a spot of roast – lamb, chicken beef, pork, or no roast at all, just vegetables – give it a go, see what you think. And before that, for my lunch, I restored myself with the most hodgepodge of soups. I conjured it up on my minus-four-degree walk, in fact, while my stomach rumbled and my face and hands stung from the cold. Soup! I started with chicken broth, stirred in a bit of leftover garlicky tomato sauce, then leftover orzo, a swirl of pesto, a handful of spinach, and a couple of tender turkey meatballs (which I make in batches and keep in the freezer). 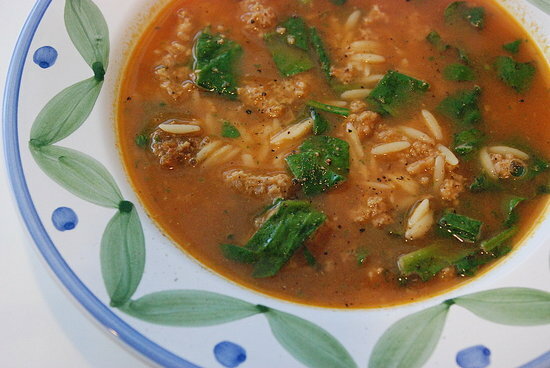 Basically a healthy, flavorful Italian meatball soup to warm me through and hold me through the afternoon. Until the meat pies. Thanks! Soup was delicious - shot looks better because of daylight. Still have not figured out making flash shots look better, although I am messing around a bit. i want some of YOUR leftovers, they look better than mine. Yay for leftovers! That soup looks divine.